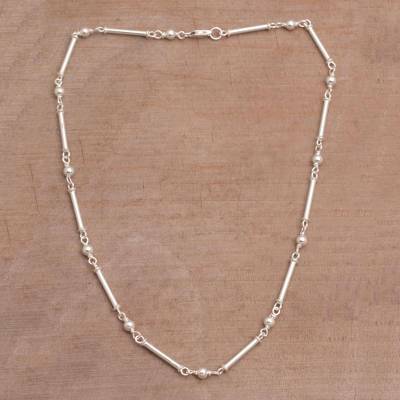 High-Polish 925 Sterling Silver Link Necklace from Bali, "Luminous Rods"
Luminous rods are crafted in high-polish sterling silver, linked together with petite bauble shapes that grace the neck. Balinese artisan Cahya Krisna designs this fantastic link necklace. Very beautiful. Thank you Wayan! Goes well as a layering necklace wit my other silver necklaces. High polished, plain, but pretty.